Join this one time class and find out what Cold Wax painting with oils is all about. 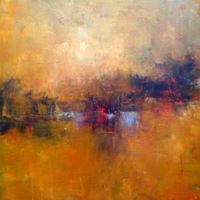 You will learn the oil & cold wax process of creating abstract work through the use of layers and color interaction. Utilizing cold wax medium, tube oil paint, pigment sticks and a variety of implements we will find new ways to create textures and mark making, along with expressive, richly surfaced paintings. You are encouraged to use alternatives to brushes such as brayers, palette knives, silicone scrapers and squeegees for this class. All supplies provided, but feel free to bring any brayers, palette knives, scrapers, etc if you have them. Just come and experience the fun of Cold Wax painting!